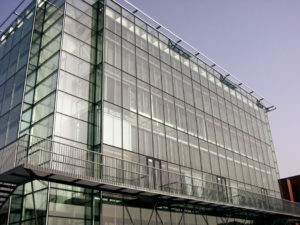 The light is the Aula Magna’s main selling point as it is a vast glass house – 70 m long by 30 m wide – on the edge of the lake that connects it to the town. 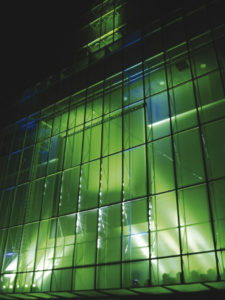 In a young town that needs to offer its inhabitants and visitors clear attractions, this new space designed by the architect Philippe Samyn offers both academic and corporate events, as well as cultural shows that ensure that the region’s influence spreads far and wide. 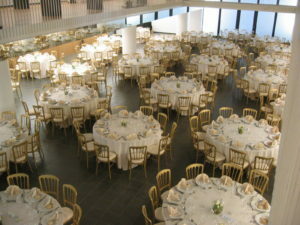 The Aula Magna’s great hall can accommodate 850 to 1,100 people depending on how it is used. The room has a large stage which is nearly 380 m2 – an exceptional size for Wallonia – equipped with a stage house and equipment that enables it to be put to a range of different uses. A vast 1,700 m2 hall is perfect for receptions for 1,500 people, as well as forums, fairs and exhibitions. 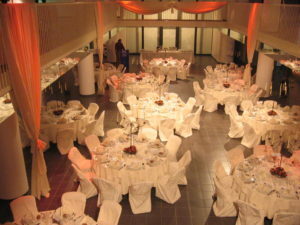 A lower level (Foyer du Lac – 700 m2) can be used for catering as well as a range of other activities. Four adjustable seminar rooms (for up to 120 people) and an upper level (Foyer Royal) with a view over the lake (for up to 200 people) complete the site. The building can be used for any number of functions: company conventions, congresses, conferences, colloquiums, forums, artistic shows (concerts, plays, dance and variety performances, as well as cinema and audiovisual events), exhibitions, dinners and receptions. These events make the Aula Magna an important site for both culture and business. Its striking presence and its use by a wide ranging public make the Aula Magna the kind of urban melting pot that our towns so badly need. 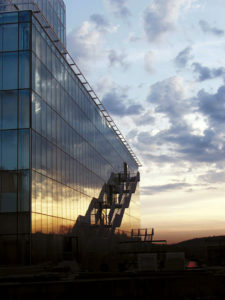 The Aula Magna contemporary conference centre was inaugurated in 2001 and is highly conducive to professional networking, offering as it does exceptional working conditions and comfort. Most of the spaces are adjustable, enabling them to be arranged to suit company conventions, technological exhibitions and fairs. The complex bristles with a huge amount of integrated equipment (lighting, sound, interpreting booths, video projection, big screen etc.) to meet the needs of large company conventions, professional conferences and summit meetings. The Aula Magna is ideally located just 20 kilometres from Brussels. It can be easily reached by road and has parking close by; there is also a train station just 500 metres away for easy rail access. The Aula Magna has been designed to accommodate a wide range of performances including all types of arts: theatre, classical music, variety performances, dance, comedy, musicals etc. The large 380 m2 stage is kitted out with a range of basic equipment (automated booms, projectors, sound systems, screen, acoustic shell etc. ).